How could I resist such a title? The whole concept of the book is unique and interesting. The scholarly preface and introductions give a helpful context for the poetry within the traditions of fine aesthetic accomplishment in the region. They explain the nuances of rhyme and metre, and the myths and legends, old and new, which are drawn upon in the imagery of many of the poems. 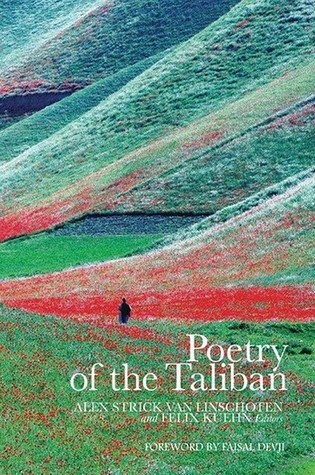 They explain how the poems were gathered and their reasons for crediting them with representing the poetic heart of the Taliban and their supporters. The poems show us a male human face, educated in the lyrical traditions of the region and aching with emotion - concerning love, loss, pain and patriotism - rather than doctrines and statements. In some ways this makes them even more powerful as propaganda tools (most are published on the Taliban's website). Though there is the occasional voice that questions and expresses self-doubt, these are almost lost amid the strident certainty of victimhood and cries of vengeance. Part of me recognises that this is with good reason - read poems such as 'The young bride was killed here', or 'The Burning Village' and you can see there is powerful justification for outrage. At the same time, this human face, this human, feeling voice, is depressingly drenched in blood. The red of blood touches almost every poem. It reads like the most bloody biblical psalms. I feel like I am meeting a very traumatised human in this book, a brutalised and brutal humanity, unable to see the humanity in those against whom it perpetuates violence, whether those labelled 'enemy' or those in its control close-by. There is a kind of security in a feeling of all-or-nothing entitlement and the self-rightness of victimhood. How can anyone argue against the victimhood? Though the layered internal politics of this country seem incredibly complex to me, people cannot be so neatly positioned as victim or oppressor. The overwhelming question it leaves me with is how the violent cycle can be broken, and how this particular victim voice can be heard in the political process of Afghanistan while recognizing the danger of its woundedness to the rights and freedoms of others. A very stimulating, though depressing read.